Virtually any "off the shelf" or custom built computer can be used as a player. Since EZ-DigiSign uses a standard Web browser to display signs, the computer will need to be connected to the Internet via wireless or a network connection. A wired network connection is preferred for connection stability. Almost any Mac or PC Based system will work using any operating system that supports a Web browser. Quick and easy configuration instructions are provided that will allow the browser to be placed in "complete" full screen mode with no scroll bars or mouse cursor showing. Power conservation and screen savers will also need to be turned off. You will also need to be sure that the computer has the right connectors to connect to the display you have chosen. The processor speed and memory needed will depend on the content you intend to use. Flash animations and video will require a much more robust machine than would a machine be used to display mostly static graphics. A DSL (Broadband) Internet connection is recommended. The EZ-DigiSign player is an innovative high-speed digital signage controller that was specifically engineered to display high-resolution multi-media digital signs. The EZ-DigiSign player has a sleek design and is one of the industry�s easiest digital signage systems to install and operate. Simply plug the display into the player and the player into the Internet and the EZ-DigiSign is ready to go. 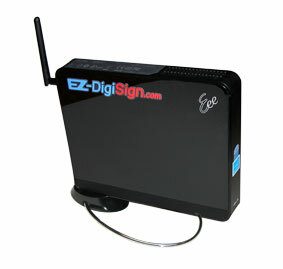 The EZ-DigiSign player, with its unique configuration, then displays digital signage. Digital signage is managed by the EZ-DigiSign subscription service. The stability of the EZ-DigiSign system is based on the rock-solid strength of our exclusive Continual Content Protection (CCP) technology. The CCP technology is a precision-engineered development designed to maintain digital signage displays even if Internet service is temporarily interrupted.